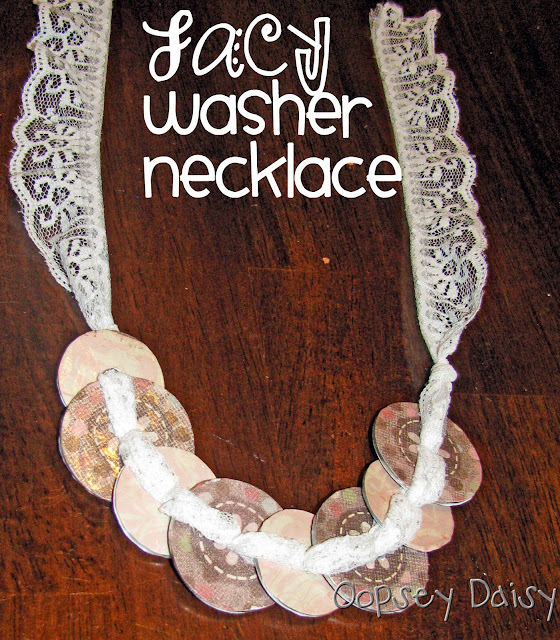 Today, I want to share my lacy washer necklace with you. Sometimes in my craft world, I neglect myself a bit. I am always making stuff for the house. For Little Man. For others. Occasionally, I just want to make something for me. It usually takes the form of jewelry... when it comes to spoiling myself, I usually prefer jewelry! Or shoes. 🙂 Lately, I have been loving my homemade necklaces. And this one is a piece of cake! 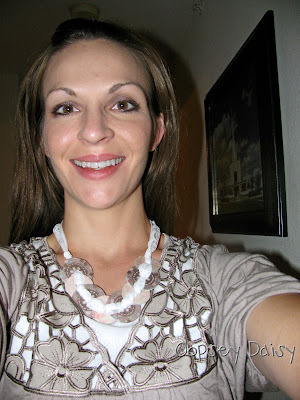 This necklace was incredibly easy to make! 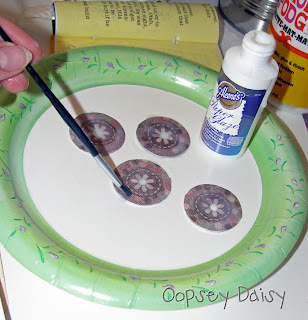 You'll just need a bit of lace, some scrapbook paper, and some washers. 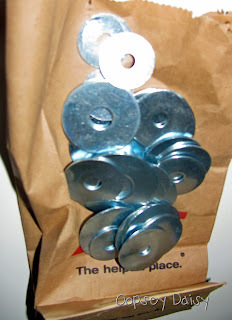 Can I just tell you how much I love washers?! I'm not sure why, but this sack full of washers just makes me happy! So many possibilities! 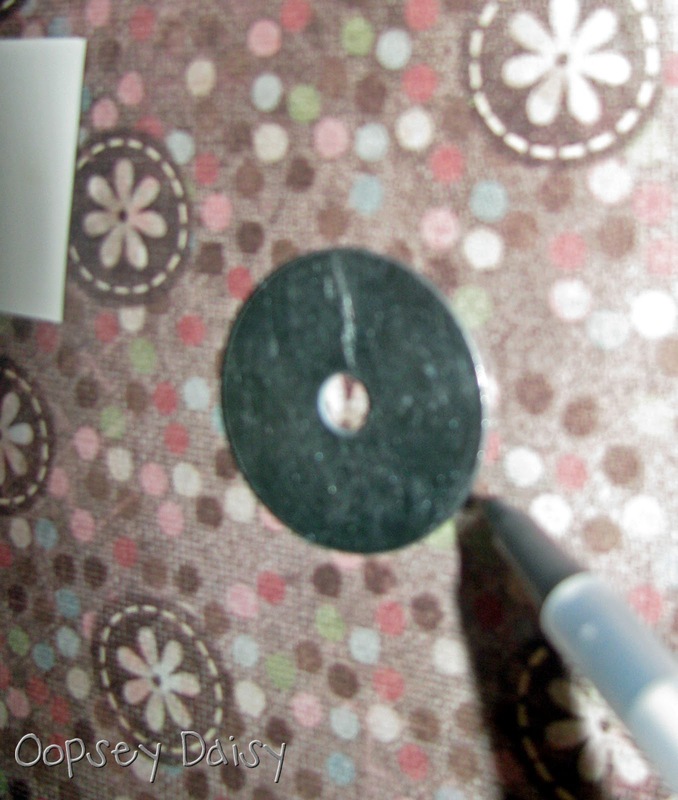 I selected 8 washers and traced them onto some cute scrapbook paper. I used 2 types of scrapbook paper, so I traced 4 on one kind of paper and 4 on the other. I mod podged paper to both sides of the washers so there would be no distinct front or back. After mod podging, I used a nail file around the edges of each washer. I wanted the paper to really become "one" with the washer. I wanted my necklace to be shiny. Almost jewel-like. Using a small paint brush, I applied Aleene's paper glaze to each washer. Give the washers plenty of time to dry. (You can work on other crafts while you wait... don't you love multi-tasking?!) Apply the glaze to both sides. To string the washers on the lace, follow Becca' instructions at Blue Cricket Design. Don't get frustrated if it doesn't come easily at first... You'll get it! Give it a couple of tries, and you'll figure out the over/under's. I tied knots in the lace before and after the washers so they wouldn't slide around. Isn't it lovely?! There is something so elegant about lace. I just tie a knot to secure it behind my neck when I wear it. I can't wait to make more and try out some new color combinations! The very day I finished the necklace, I wanted to wear it. So I did. I wore it to my birthday dinner! Here I am, modeling it, in all of my up-close glory! Wouldn't it be fun to make this in holiday colors?! Such an easy stocking stuffer! Very pretty! The paper you chose looks great with the lace! 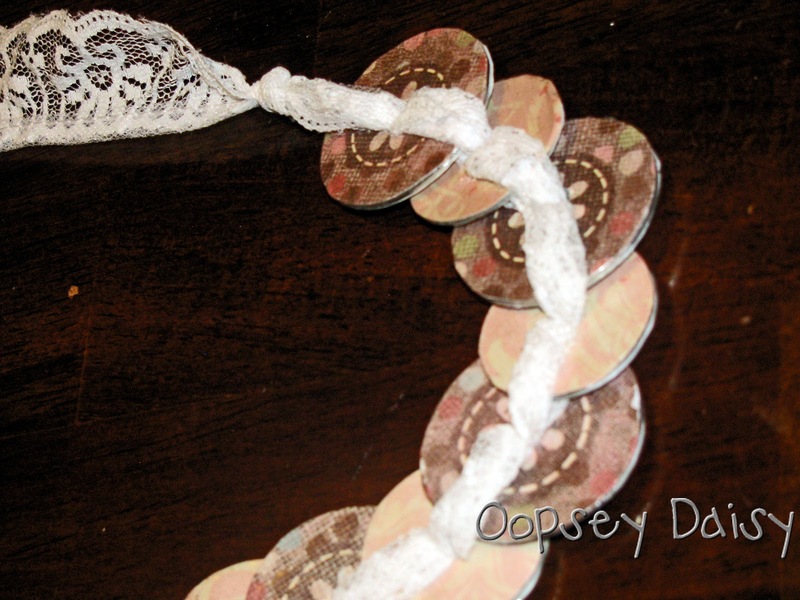 Who would have thought of washers and lace together! Love it! This is the prettiest washer necklace I've ever seen. I absolutely love the combination of the washers and the lace! I like how you tied in the scrapbook paper! You gave me a great idea for what I'm going to do today. Great necklace! Need to find me some washers! How cute! 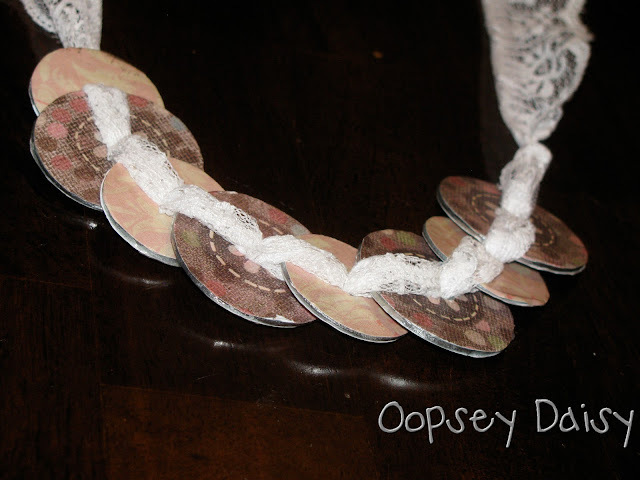 I've seen washer necklaces but not with scrapbook paper on them. so cute…i love the lace…. I made one for my sister for Christmas…I linked to this post and thought you'd like to know 🙂 Thanks for posting! !